Architects, designers and developers now have an exciting new source of inspiration with a vastly extended choice of pre-coated and post-coated steel and aluminium cladding panels, as the paint suppliers including Azko Nobel and Tiger Drylacare offer a greater array of finishes and options. When a painted finish is specified for a cladding project most people think of PPC (Polyester Powder Coated), which remains a popular post-coated finish because of its long term performance benefits. However, PPC is just one of many options available when it comes to painted steel and aluminium rainscreen cladding – with the principal decision being based on whether to choose a pre-coat or post-coat applied finish. The range of solid RAL and BS colours available is similar whether the cladding panels are manufactured using pre-coated or post-coated on an aluminium or steel substrate. However, pre-coated aluminium cladding panels offer more choice if you are looking for a textural, patterned or grained rainscreen façade, while the post coated options are increasing with Azko Nobel recently launching new options to mimic stone effects offering clients another option to an already extensive array. What are the benefits of pre-coated aluminium cladding? Pre-coated steel and aluminium rainscreen cladding panels can be a good choice where large quantities are required. A pre-coated material is procured in bulk and offers a fixed finish per batch, so minimising any potential shade variation between panels. Pre-coated materials allow longer panels to be produced with the ability to roll form panels in excess of the typical bench press limitations of PPC options. There is now an extended choice of pre-coat colours, textures and finishes available aside from any RAL of BS colour. For instance, our pre-coated sand-effect finish Design Terra Sand is a popular choice where designers are looking to give the façade a natural, textural finish, or to manage its reflectivity, but still with all the performance and longevity benefits of pre-coated aluminium. Our Design Terra Sand cladding panels refract daylight in ways that give the façade an attractive matt sheen. Unlike a natural stone façade, pre-coated Design Terra Sand, when specified on our Proteus HR, is light yet incredibly strong with high tensile strength. We can also fabricate large format panels incorporating three-dimension shapes by using folding and roll bending techniques, creating the look of ashlar coursed stone of large cornice and plinth blocks. Woodgrain finishes are also available with our pre-coated aluminium, which again offers all the benefits of a natural timber façade aesthetic but without the outgoing maintenance burden. Alongside this, our metallic pre coat aluminium finishes like bronze, gold and titanium, are able to give the façade a cutting-edge futuristic look. A popular pre-coated aluminium cladding is our PVDF paint finish. The University Hospital of North Staffordshire, is a good example, with our RAL 9006 pre-coated PVDF paint finish providing a linking material between the various phases. We preformed the Proteus HR panels in flat, cranked, facetted and pre curved panels to meet the geometry required by the design. 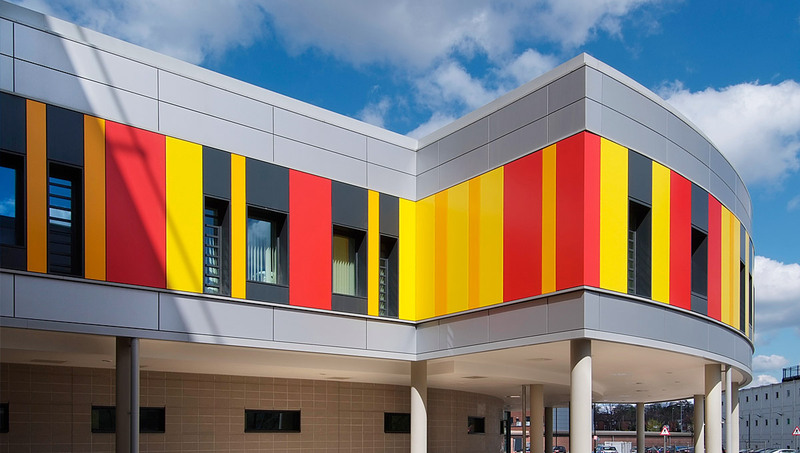 The PVDF finish was then complemented with a bright and bold colour pallet of Red, Orange and Yellow PPC coated Proteus HR aluminium panels, creating an inviting main entrance and focal point to the building. To the rear, a more subtle tone of Proteus HR panels with a PPC finish in a variety of blue colours was chosen to provide a more relaxing atmosphere for patients and visitors. 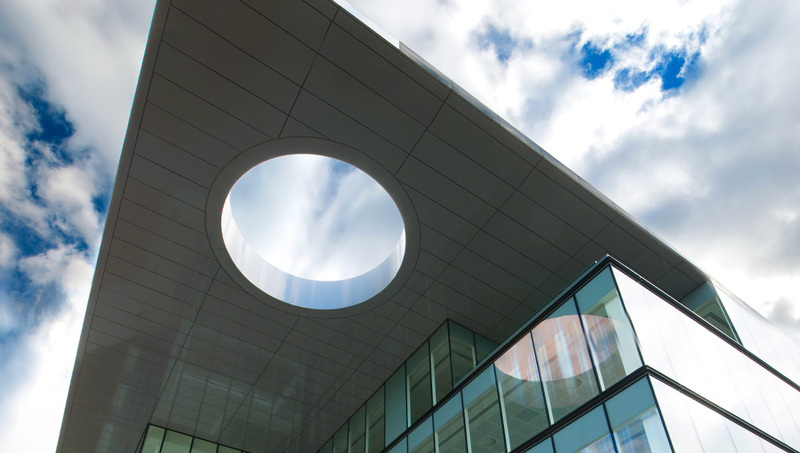 Our Colorcoat® pre-coated steel rainscreen cladding was developed specifically to support the aesthetic and functional requirements of modern architectural designs. The pre-finished steel panels are able to withstand the demands of the external environment, are lightweight and strong, making it an ideal choice for building envelopes for long lasting colour. A good choice where there is a specific budget requirement that has to be met. What is post coated aluminium or steel? PPC (Polyester Powder Coated) as it is commonly referred to is a high quality, aesthetically pleasing and durable finish that is applied after the panel is fabricated. The powder is electrostatically applied to the aluminium or steel substrate and cured under heat providing a durable and stable finish. The process allows the powder to be applied to more complex shapes which would be unachievable with a pre coated material. PPC is available in a wide range of colours and is much tougher than normal paint. It’s outstanding abrasion and corrosion resistant properties make it extremely durable and long lasting. Post coating of aluminium and steel rainscreen cladding panels is often specified by designers because it provides a number of benefits. One of these is that it allows greater flexibility on size, for example, welds can be dressed and then PPC finished, meaning it is possible to create very large panels that appear as one, homogenous form. The aesthetic effect this creates across a building facade can be quite striking. It is still common for people to think of PPC in terms of standard RAL or BS colours, however there are now many different finishes to choose from, including specific gloss levels. The Akzo Nobel Futura range, is a special finish that is particularly suited for use on cladding projects such as rainscreen and soffits. It includes three completely new finishes: silky texture, cotton and, a new recently released set of stone-effect PPC finishes. While also offering a standard wide range of colour and broad spectrum of gloss levels as well as textures and metallic effects. That makes it suitable for cladding and façade projects where a high level of aesthetic appeal is required. Another supplier Tiger DryLac, offer a range of finishes that are designed to mimic the popular Anodising finishes. Although the options generally offer a matt finish compared to the more glossy finish of Anodised Aluminium, it does offer clients a good value engineering option when budgets are tight. When specified with our Proteus HR panels, which feature a honeycomb core for strength and impact resistance, it can provide a robust cladding panel for low level applications, and incorporate anti-graffiti options. 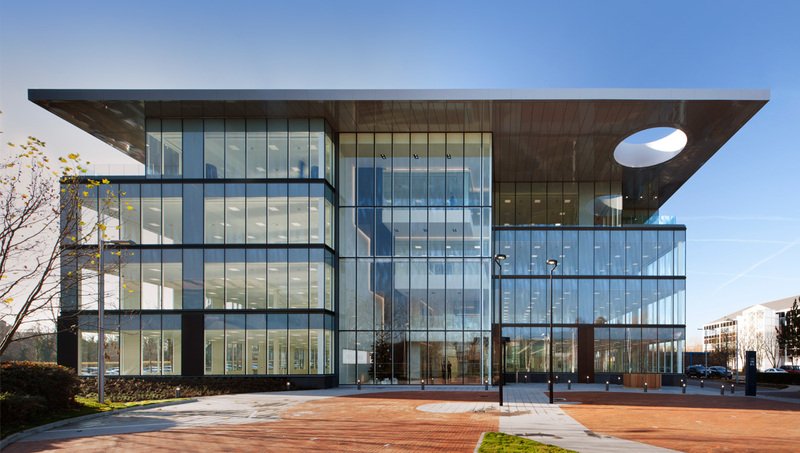 A great example of a post coated PPC aluminium, executed in high gloss Proteus HR soffit panels and rainscreen cladding is the 4 Longwalk development in Stockley Park – Grade A offices next to Heathrow airport, London. We post coated the aluminium entrance, atrium and dramatic roof soffit with PPC high gloss in RAL 7004 Signal Grey. It is possible to specify different paint gloss levels with our PPC cladding panels. These are typically classified as Matt 30% shine, Satin 70% shine, Gloss 85% shine. Each of these will change reflectivity, adding to the façade aesthetic – we are always happy to discuss the available options in terms of gloss levels as there are a number of factors to consider. For instance, if the façade cladding is exposed to ultra-violet rays the finish may benefit from being coated with a polyester finish to enhance its UV stability. It is the contrast between different cladding colours and finishes that give most building’s their distinct, individual identity. These differences can be accentuated by the subtle changes in colour, gloss or texture specified for the cladding panel. With a vastly extended choice of pre coat and post coat steel and aluminium panels now available it is possible to make each building unique, and that can only add interest to our architectural landscape. View our full range of pre-coat and post-coat aluminium rainscreen cladding options.